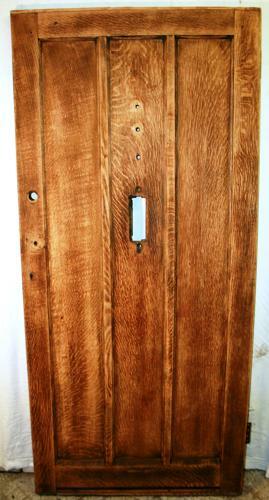 A solid and heavy, reclaimed, oak door with 3 straight panels. The door has been stripped to bare wood and has an attractive colour and grain. The door has plain moulding inbetween each panel and a solid edge and base rail. The door has a lovely classic, period style. There is a space for an unusual vertical letterplate. The door is ready for finishing by purchaser, with perhaps a varnish or wax, suitable for exterior use. The door also requires hardwear, to be supplied by purchaser. The door is reclaimed and therefore has some signs of wear. The base edge has some splits and knocks. One face has a gouge in the oak and there is a wood knot, please see pictures for details. The door has some holes and wear from hardwear removal. There is a slight gap at the base of the door and the door has a top batton that could be removed by purchaser if desired. There are some slight colour variations to the oak, marks and scratches. The door is solid and attractive, ideal for a period or country home. The oak is of a great quality and is a desireable and stylish item.